Packing just one solid-color tee shirt can greatly expand your clothing options, no matter what the purpose of your trip may be. When packing light, I select a plain tee-shirt in my basic wardrobe-palette color: black. Alone or under a sweater, a simple tee shirt worn with jeans or a travel skirt is perfect for enjoying casual activities with friends, business associates, or your host’s family. 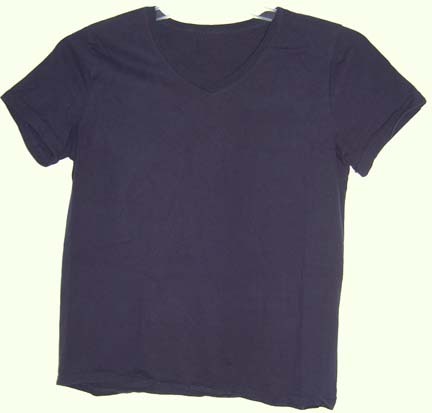 Because it has no logo, a solid-color tee shirt can also serve as a core element when you’re planning outfits to wear in a business-casual environment. Dress up the shirt with a smart jacket or colorful scarf. Pair it with pajama bottoms for your nighttime sleepwear. Wear it to the hotel’s exercise room for your workout. Layer it beneath your business outfit as a toasty undershirt in a winter climate. Lest we be inundated by e-mails from your fellow travelers whose olfactory senses are offended, we recommend that you also read our series on doing your own hand laundry and then wash the shirt often. Fiercely Frugal Savage Sister Diana has gathered packing pointers over the years on numerous domestic and foreign trips. Most recently, she travels in conjunction with the publication of her latest book, 52 Heart Lifters for Difficult Times. WordPress may post an ad below. Please be aware that the Savage Sisters have no control over (or knowledge of) any ads you may see. This entry was posted in Pennywise Packing Pointers and tagged carryon, clothes, creative solutions, luggage, packing, tee-shirt, wardrobe. Bookmark the permalink.